Manufacturer of a wide range of products which include moringa tea dip bag. The Moringa tea is an excellent energy drink. 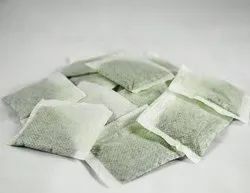 You can prepare a tea by steeping a handful of dip bags in hot water for a few minutes. Buy Moringa Tea from 100% Pure Moringa leaves. Moringa Oleifera tea is so healthy and delicious. Moringa leaf tea packs a huge nutritional punch. In fact, it is not a tea at all. All teas are derived from the Camellia sinensis plant. Moringa tea is actually a tisane and unlike tea, containsno caffeine,which means it can be enjoyed by the whole family.Moringa dried leaves are packed with various minerals and Vitamins. When the dried leaves are dipped in hot water, the water soluble contents of the Moringa leaves infuses into the hot water and results in a healthy beverage. Moringa leaves are alsorich in flavonoids. This multiple number of nutrients present in the Moringa leaves makes it a perfect raw material for Herbal Infusion. Looking for Tea Bag ?